DAMA TWENTY PEAKS is a climbing challenge. To meet the challenge you are required to choose 20 mountain passes out of the total available in your edition and climb them in a 6-month period. This typically means a few hundred km up hill and around 15,000m ascent for each edition. Upon registration, you will receive a top quality cycling jersey from DAMA Italian sportswear and if you manage to finish all climbs on time we will award you the matching Finisher bib shorts. Whether you are a racer or a Tourer we have a great challenge for you! 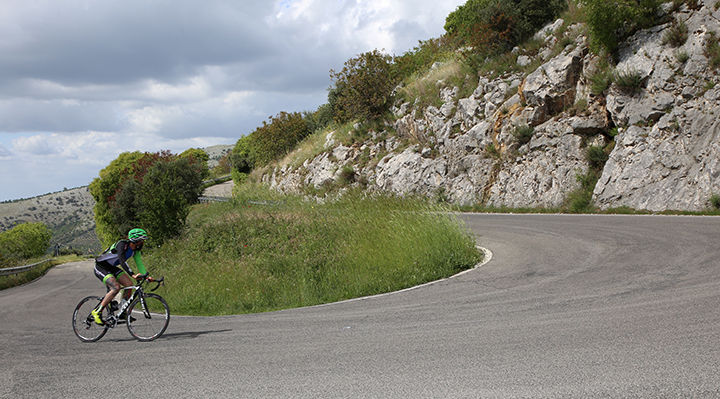 If you are looking to optimise your climbing skills while discovering new and exciting routes make sure you integrate the Twenty Peaks in your cycling season. If, on the other hand, you are looking for the KOM title on each climb, choose the 20 climbs marked with the trophy symbol. They make the 'Race Zone' - where the first 15 riders are classified on each climb. Much like the mountain classification of the gran tours, Twenty Peaks holds a general classification for each edition and rewards the winners for their achievements. Connect your Strava account to DAMA TWENTY PEAKS, sign up for one or more editions and get your jersey. If to reside in Italy your jersey will be delivered to your address in 2 weeks time. If you have subscribed to an edition outside Italy, please allow us time to consolidate a shipment to your country and deliver it to your address. Next, you should start climbing as soon as your edition is live. In order to win your Finisher bib shorts you will have to finish all 20 climbs before the end date. Make sure to stay exactly on the clim’s route otherwise you might not get credit for it. We've sent you a link to confirm your email address. Please check your inbox. It could take up to 5 minutes to show up in your inbox. Confirming your email will allow us to send you notifications for the climbs you've done, inform you whenever we update one of our climbs and generally keep in touch during the season. Your current email address is . Please enter your new email address. Your email address has been confirmed.